MIND is at AC 2018! Follow what’s happening on social media. MIND will be posting regular updates on our Facebook and Twitter pages, so please follow and repost anything you think deserves a wider audience. The general AC hashtag is #nyacumc and the one we’re using to promote the majority-queer, majority-POC group running is #WithNotAbout. Please follow, and please use the hashtags to help your posts get noticed! #WithNotAbout. A major piece of business for this Annual Conference is the election of representatives to the special General Conference next year. 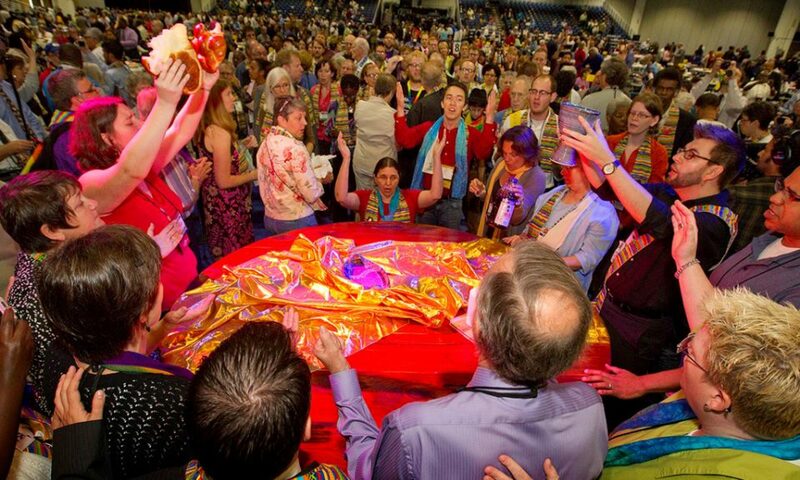 Since this GC is focused on whether the UMC should continue to promote discrimination against LGBTQ people, we support the idea that LGBTQ people ought to be included in this conversation. You can read much more about this at https://www.withnotabout.org/. Tell a friend. Every person in this movement got involved because of a conversation. Why not introduce a justice-oriented United Methodist to this work yourself? Have the difficult conversations at coffee hour! Share our Facebook and Twitter posts with comments telling people why ending church-sponsored discrimination is important to you. Keep us in prayer. Annual Conference is all too often a bruising experience for LGBTQ people. We ask that you keep your queer siblings in prayer, and that you join us in a prayer for this ongoing harm to end. Show your support! Friday is t-shirt day. As conference veterans know, we ask everyone who supports the full inclusion of LGBT people in the church to wear the distinctive purple shirts on Friday as a witness to the entire conference. For LGBT people attending, the sight of the shirts in the face of the denunciations of their ‘sinful lifestyle’ is a lifeline in a hostile environment. Wearing the shirt matters! 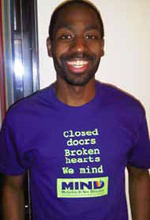 The shirts, which predate MIND and in fact inspired our name, say “closed doors, broken hearts, we mind,” in reference to the UMC’s official and unfulfilled slogan “open hearts, open minds, open doors.” You can buy the shirt online. Please stop by our table and say hello! We’d love to meet you, and are happy to point you towards resources to help join the work of LGBTQ advocacy in the UMC.